Mannington is a house full of history. 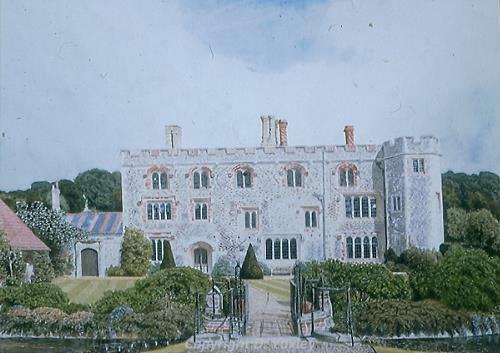 Built by William Lumnor, a friend of the Paston family, in the middle of the 15th century, it passed through several owners before it was acquired by the Walpoles of Wolterton. ­Horatio Walpole, first Lord Walpole of Wolterton, was a brother of Sir Robert Walpole. The west side, shown here, is basically flint and brickwork of the 15th century, but the scars on the surface, made by the removal and alteration of windows in later periods, make it a fascinating building to paint. David Yaxley was born in Mundesley, brought up in Paston, and educated at The Paston Grammar School, North Walsham. After National Service in Egypt he took a degree in History at University College London. He has written and lectured on local history, art history, and architecture for the W.E.A. since 1964. His wife Susan, also an historian and writer, and his elder son Thomas run The Larks Press, which has now produced a hundred and twenty titles - history, memoirs, biography, natural history, maps, reference, quizzes, fiction - all connected with Norfolk by author or subject. David Yaxley has been painting seriously for over thirty years, and has had solo exhibitions of watercolours and drawings at Holkham, Hales Hall, Burnham Market, Litcham, Cley, Sheringham, The Crome Gallery and The Assembly House, Norwich. He is a regular exhibitor at The Royal Norfolk Show, and has contributed to many other exhibitions around the county. He has been Archivist at Houghton Hall since 1971.